A "courageous, compassionate, and rigorous every-person's guide" (Christina Bethell, PhD, MBH, MPH Professor of Child Health, Johns Hopkins Bloomberg School of Public Health) that shows the link between Adverse Childhood Experiences (ACEs) and adult illnesses such as heart disease, autoimmune disease, and cancer Childhood Disrupted also explains how to cope and heal from these emotional traumas. Your biography becomes your biology. The emotional trauma we suffer as children not only shapes our emotional lives as adults, but it also affects our physical health, longevity, and overall wellbeing. Scientists now know on a bio-chemical level exactly how parents' chronic fights, divorce, death in the family, being bullied or hazed, and growing up with a hypercritical, alcoholic, or mentally ill parent can leave permanent, physical "fingerprints" on our brains. When children encounter sudden or chronic adversity, stress hormones cause powerful changes in the body, altering the body's chemistry. The developing immune system and brain react to this chemical barrage by permanently resetting children's stress response to "high," which in turn can have a devastating impact on their mental and physical health as they grow up. Donna Jackson Nakazawa shares stories from people who have recognized and overcome their adverse experiences, shows why some children are more immune to stress than others, and explains why women are at particular risk. 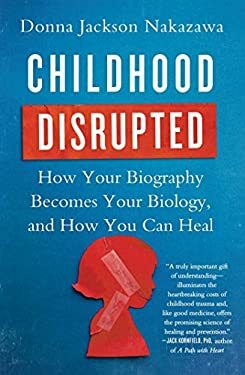 "Groundbreaking" (Tara Brach, PhD, author of Radical Acceptance ) in its research, inspiring in its clarity, Childhood Disrupted explains how you can reset your biologyand help your loved ones find ways to heal. "A truly important gift of understandingilluminates the heartbreaking costs of childhood trauma and like good medicine offers the promising science of healing and prevention" (Jack Kornfield, author of A Path With Heart ). New (73 available) BRAND NEW. Over 1.5 million happy customers. 100% money-back guarantee. Make your purchase count: support Better World Books' worldwide literacy partners.